Should Your Site be Written in Plain English? Can plain English help boost your conversions? Can it help facilitate user interaction? Yes, it can. Plain English mightn’t sound exciting. Who wants “plain” English when you can have whiz-bang marketing copy that makes your offering sound like the best thing since the iPhone 5? The answer is: your users. If the web’s done one thing, it’s made business owners realise the value of clear, fast communication. Printed brochures that your audience can take home and pore over are one thing, but a website that has a directly measurable conversion goal, or needs to facilitate independent interactions, is another. Plain English … and conversions?! This idea—that plain language can help your conversion rates—may seem like heresy. The whole point of marketing is to make your offer sound so good that your audience finds it irresistible, right? Well, sometimes. Some very particular audiences can sometimes find complex language flattering. But for the most part, ordinary people find plain language easier to read and comprehend and, we could extrapolate, act upon. You’ve probably seen this in your own user testing of copy or websites. Simpler, more direct language usually makes actions clearer to users. And if you’ve targeted your communication to the right people, less confusion usually means more clicks. We’ve talked before about CTA language, and there we saw how a CTA that communicates what will happen when you click is usually clicked more. The same applies to interfaces for products or systems. If users know what to expect when they click, they’ll find your offering easier to use. This is why many of the established best practices for various labels within interfaces are indeed so plain: Home, Contact, Back, Next, Save, Send—the list goes on. So what is plain English? each sentence expresses one idea. Since plain English tends to be easier to read than more complex language, it usually gets lower readability scores, too. Let’s see some examples. 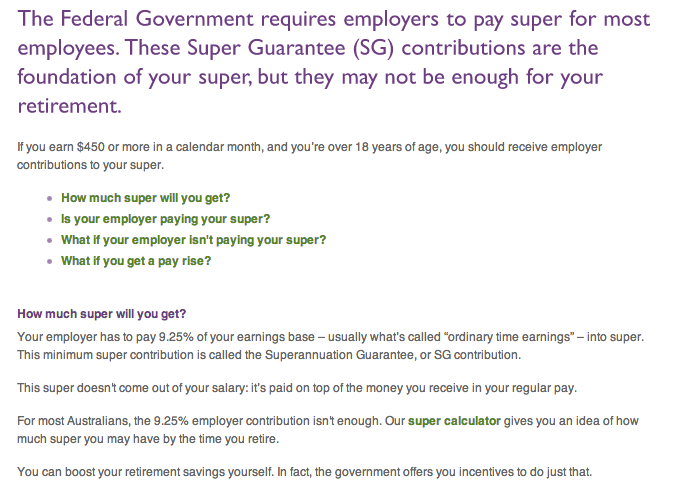 From a typically jargon-heavy industry: superannuation. This is a great-looking page: simple, concise and clear. But looks can be deceiving. This text has a reading grade level of 12.2 and a readability score of just 32.5. The fact that only one of the three is a full sentence probably doesn’t help. What about this page? More text, more complex, right? Well, no. Firstly, it has a reading grade level of just 6.1—the average sixth grader can comprehend it. And its reading ease is 70.5. Now, sometimes these scores can be affected by the length of the text inserted. So let’s look beyond the numbers to the actual text itself. While the second piece of text still uses “jargon” terms, it introduces them and makes a point of explaining them. The first piece uses these terms, but doesn’t explain them at all. 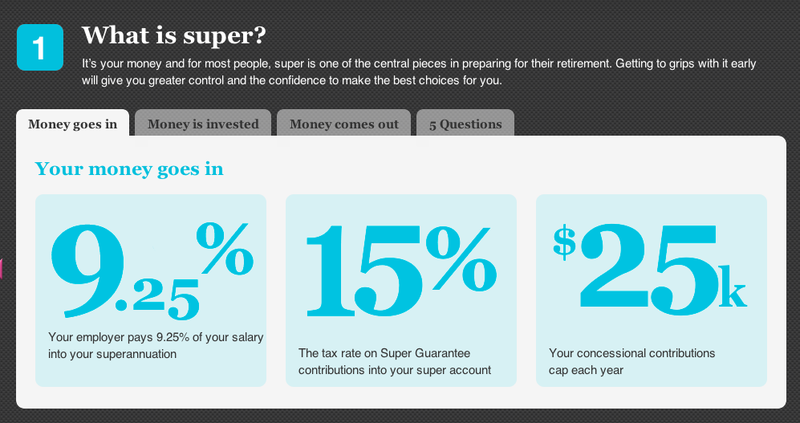 What are Super Guarantee Contributions? What are concessional contributions, and what’s a cap? The design doesn’t reflect any relation between these things either, so it may well be confusing for users. If you take a look further down that same page, you’ll see that Super Guarantee is explained in more detail, but it’s still not defined anywhere. If you don’t know what it is, you won’t understand this content. That’s the key problem that plain English seeks to avoid. If you’re using plain English, your text will openly define any jargon up front. There should be nothing on the page that an ordinary person who’s unschooled in your product or category can’t understand. Everything they need to understand your message should be on the page. To bring this into the realm of startups, let me give you another example. I was speaking to a business owner last week who was trying to work out how to describe his app. Was it a “service”? A “platform”? Just an “app”? A “tool”? In the end, he narrowed it down to being either a service or a platform. From a plain English perspective, this is pretty pointless, and for his mass audience, which would include plenty of people who wouldn’t know a platform or indeed a service from a hole in the ground, this fine distinction was pointless: whichever of those words he chose, it would mean nothing to them. Are you wasting precious time wrestling with jargon that’s irrelevant to your actual users? Could you just simplify by choosing a less high-falutin’ word that they already know, and can understand? Is plain English for you? are targeting people from a range of cultural backgrounds, who may not have English as a first language. There are other cases in which plain English may be useful—as I mentioned above, with certain products, services, and audiences, it can boost conversions. It can help make your interfaces and interactions clearer. And it’s extremely helpful—I’d say essential—when applied to Help content, product documentation and FAQs. I’d love to hear how conscious you are of using plain English in your interfaces, help, and marketing pages, so let us know your thoughts in the comments. One thing, though: if you think the story stops here, think again. You know the basics of plain English, but what about natural language? It sounds good … but is it? Next week we’ll see how natural language can help—or hinder—your efforts to speak to your users online.